The best of life in Brixham! This is my kind of meal! Everything fresh, grown, recycled, found or gifted! At this time of year, sprats are fished in the area. The seagulls know what time the boat is coming back in (how do they know?) and go out to meet it, so I was ready with my camera when I saw them flocking out to sea. Sure enough, within a few minutes, the sprat boat hove into view, complete with every seagull in Brixham in tow. Actually, if the sea were warmer, I would be following the boat too, like a large seal! We’ve been lucky and have occasionally been given a mixed bag of sprats, anchovies and herrings. And when I say ‘bag’, I mean shopping bag held under the boat hopper and filled with about 20 pounds of quivering silver beauties! 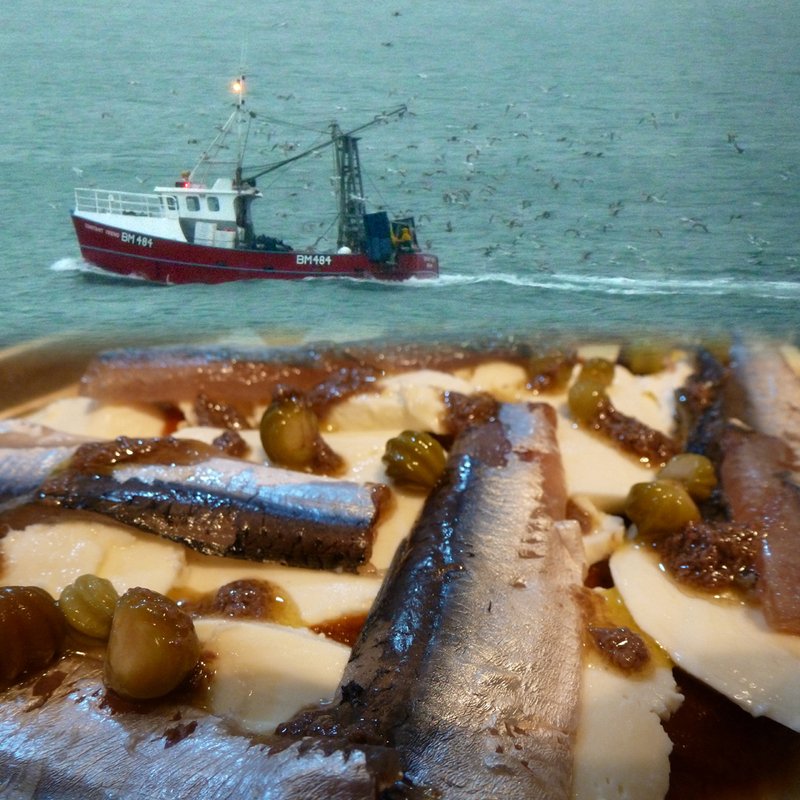 This time the herring were full of roe and I was able to have a delicious fried roes on toast for lunch, as well as a freezer full of fish. Anyway, back to ‘Pizza Brixhamara’, which is more of an idea than a recipe. My greenhouse tomatoes are still ripening – amazing when it’s nearly December! I had about a kilo, which I chopped and sweated with a couple of cloves of garlic and olive oil until they were well broken down (about 20 minutes). I pushed this mixture through a sieve. That’s essential at this time of year because the tomato skins are very tough, and if not removed they roll up and stab your throat like pine needles. Not nice. I returned the ‘passata’ to the pan, added a splash of Balsamic and a teaspoon of brown sugar, and simmered until reduced down to a thick sauce. I used leftover mashed potato to make two bases. I added 1 egg, then self-raising flour until I achieved a pastry-like consistency. This was the pushed and patted into pizza bases and cooked in a hot oven for 10 minutes. 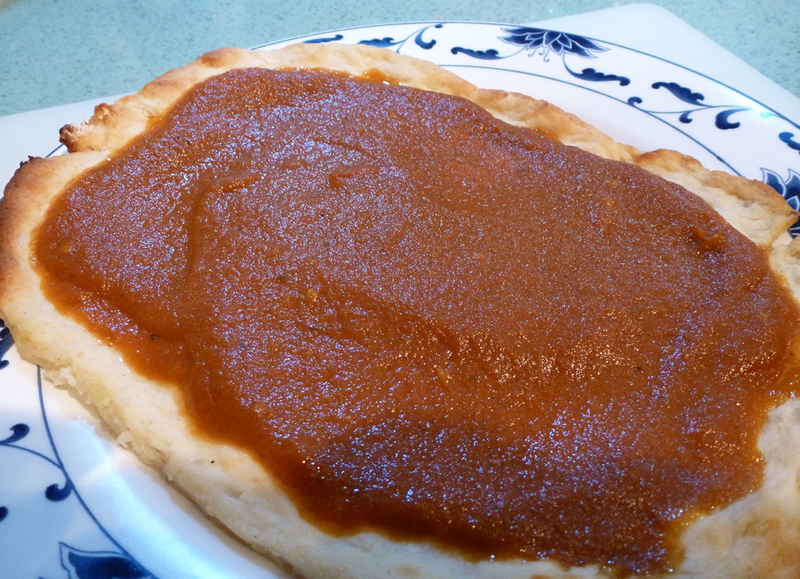 I then spread the tomato paste on the bases. I had way too much, so I put half of it on, then gave it a blast in the oven for 5 minutes, took it out, added the rest of the sauce and blasted it again for a further five minutes. These little miracles are VERY tomatoey! Pizza base, topped with tomato that has been reduced and double baked to make it even MORE tomatoey! At this point I cooled one of the bases down and froze it for future use. To the other I added sliced mozzarella, fileted fresh anchovies and capers*, then drizzled it with some anchovy paste which I’d loosened with some olive oil. Whack it in the oven for a further 15 minutes, and serve. It’s a perfect mix of crisp, sweet, salty, and creamy, with a taste of the ocean. I always think I’m only going to eat half of it, but I usually go back for seconds and end up eating it all. * Actually, my capers were pickled nasturtium seeds that I’d rescued from my hanging baskets. They’re not entirely successful this year, having a great flavour but being a bit crunchy! So, a real taste of Brixham, which only cost me the price of the mozzarella (Sainsbury’s Basics, 41p). That titillates my tightwad taste buds! This entry was posted in Food, Frugality, Gardening and tagged Brixham, food, frugality, gardening, recipes. Bookmark the permalink. Sounds delicious. Anchovies are the food of the gods. Your sauce sounds great. Perhaps destined for fame as a local delicacy ? !